With their huge advertising budget and generally glowing reviews across the internet from professional website builder review sites, Wix needs no introduction. Having said that, after updating my own Wix review recently and looking at customer reviews, it was plain to see that Wix isn’t the right choice for everyone which Is why I’m guessing you’re here looking for an alternative. Below, I’ve listed 4 realistic alternatives that may suit you better depending on your needs. For those in a hurry, you’ll find an overview of the website builders, then we’ll take a quick look at look what Wix does well and where it lacks followed by a closer look at each platform. Weebly – Great for people who want a simple, yet solid all-arounder (read review). uKit – Perfect for business websites (read review). Squarespace – Great for visual business, photographers, designers, artists (read review). Shopify – Specialist eCommerce builder for online stores of all sizes. #1 Easy to use: Although it may look a little daunting at first, it doesn’t take long to get stuck in adding text, uploading images, and integrating add-on features (apps) thanks to the user-friendly interface. #2 You’re in control: With Wix, you’re in the driving seat when it comes to how your page looks. You’re free to pick stuff up and drop it wherever you want on the page. Not a luxury you have with all website builders. #3 App Market for advanced features: Wix has hundreds of Apps (add-on features) allowing you to add all kinds of functionality to your website. From Hotel bookings to forums, to live chat features. #4 500+ gorgeous templates: Whatever business you’re in, whatever project you need a website for, Wix probably has a template to match. If not, you’re sure to find something similar that can easily be adapted. #5 Separate mobile editor: I like to play around with how my website looks on smartphones and tablets as I don’t always want exactly the same look as on a PC or laptop. Wix allows you to make changes with their mobile editor. #6 Enough eCommerce tools for small store: While not a specialist eCommerce platform, Wix provides enough tools for you to create a functional, modest sized store. Sell physical & digital products, create product variations, tax and shipping calculators, inventory management, and a range of payments options. #7 Great help and support platform: I’ve received timely help from the customer support team on several occasions. You’ll also have access to plenty of written and video tutorials to help you create your site. #8 Try before you buy: Wix offers you a free website option and while many features are restricted and you’ll have to put up with quite visible ads, it’s a great way to get a feel for Wix before deciding whether to commit. #1 Can’t change templates: Your first job after signing up is to choose a template (or opt for a blank one) and this will decide the look and feel of your website. Once you’ve made a decision, you can’t swap it for another unless you want to start again and copy and paste all your text over to the new one. #2 Visible ads even on the cheapest premium plan: I completely understand Wix slapping their advertising all over the free websites, but when you upgrade to their cheapest plan, you’ll still have to put up with them. That’s something I really don’t agree with. #3 Too much freedom can be a bad thing: I’ve also used this as an advantage of using Wix but it can also be a bad thing. Most who use generic website builders aren’t usually web designers and sometimes too much freedom without guidance can make for an ugly site. #4 Build your website from a PC or laptop only: Although your site will work on mobile devices, you can’t at this time build, edit, or manage your website from a tablet or smartphone. Instead, you’ll have to use a PC or laptop. Say hello to one of the simplest website builders out there. Weebly allows just about anyone, to create a good-looking, functional website in the shortest time possible regardless of your previous experience. Simple drag and drop website editor. Quickly build your pages with pre-made sections of content. Mobile friendly, no additional work required. Create, edit & manage your website on your tablet or smartphone. Add additional functionality to your site with the App Center. Serious contender for a membership website. Solid eCommerce & blogging platform. Free website option with discreet ads. Weebly’s templates are well designed although rather generic. Customization is fairly limited in comparison to Wix. No way to edit the mobile version of your site separately. Weebly offers a free website option with no end date. Good for testing the platform out although many features are restricted and you’ll have ads displayed on your site. Should you decide to upgrade, you have a choice of four premium plans ranging from $8 to $38 per month (when billed annually). Rather than being just another generic website builder like Wix targeting anyone and everyone, the team behind uKit have dialed in and focused all of their efforts on small business owners and I have to say, they’ve done a great job of it. Easy to use drag and drop website editor, less cluttered than Wix. Approaching 300 great looking business-focused templates to give you a head start. Create a booking form and allow your customers to schedule appointments online. uKit offers a “Done for you option” at a small cost. Mobile friendly which displays your contact details making it easy for people to call or email. In-depth tutorials to help you create your website. 7-day free trial to test things out. No free website option making it not ideal for personal or hobby sites. Appointment scheduler could be a little simpler to set up. Like Wix, you can only build and edit your website from a PC or laptop at this time. As I mentioned above, uKit gives you a 7-day free trial to test things out. After which time, you can choose from four premium plans ranging from $4 to $12 per month for an annual plan. Visit uKit – Take advantage of uKit’s 7-day free trial. Although Squarespace is one of Wix’s biggest competitors, I can’t help but feel Squarespace is in a different class as they give you the tools and templates needed to create a very professional looking website. High-quality templates ideal for visual businesses, photographers and designers etc. A plethora of customization options allowing for a unique website. 14-day free trial to test things out. The support team will be there when you need them. Ability to integrate third-party tools for added functionality. Slightly steeper learning curve than Wix. No free website option so not ideal for personal or hobby websites. When you sign up you’ll bag a 14-day free trial. If you choose to continue after your trial, Squarespace has 4 plans to choose from. Two are dedicated to regular websites and the other two are specifically for eCommerce. They range from $12 – $40 per month (when billed annually). Visit Squarespace – Take advantage of Squarespace’s 14-day free trial. 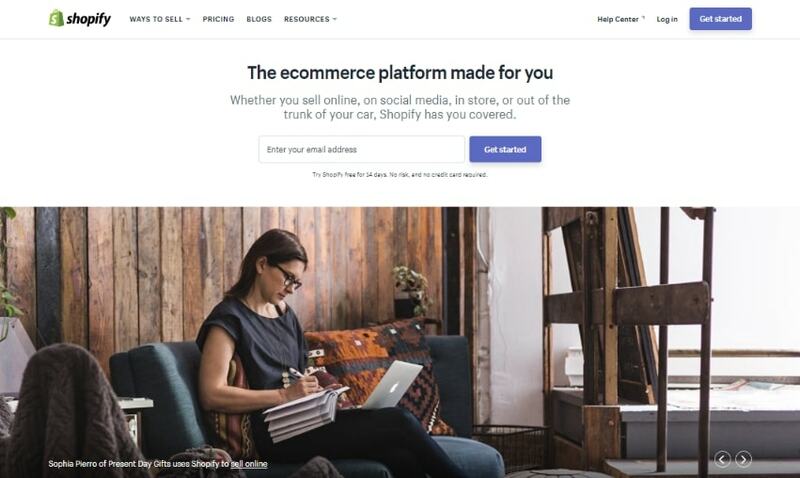 As I mentioned earlier, where Wix is a generic, all-around website builder with the ability to create an online store, Shopify is a specialist eCommerce platform for people serious about selling online. 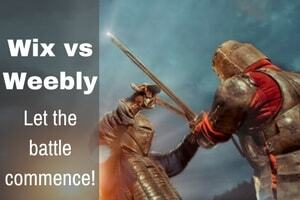 Over 100 free and premium high-quality templates to choose from covering a range of industries. Over 1,000 apps (add-on features) allowing you to add functionality to your site. Around the clock support in case things go wrong. eCommerce platforms always seem a little daunting to me. Fortunately, Shopify is beginner friendly. Everything you need to create a store of any size all under one roof. Mobile visitors can make purchases directly from their tablets or smartphones. The cheaper plans still have transaction fee’s associated. Shopify may not be the most cost-efficient solution if for very small, basic stores. Many of the apps (add-on features) have additional costs attached (similar to Wix, Weebly, and Squarespace). Shopify gives you 14 days to see if it’s the right platform for you. They have 3 premium plans ranging from$29 – $299 per month (when billed annually) depending on the size and complexity of your store. Visit Shopify – Take Shopify for a 14-day free test drive. Wix maybe one of the most popular website builders around but its definitely not perfect and has its own set of flaws just like every other platform. After all, nothings perfect. So, if you’ve tried Wix and decided that it’s not for you, Weebly, uKit, Squarespace, and Shopify are all fine alternatives depending on what type of website you want to create. The best thing to do in my humble opinion is to choose one or two platforms from the list above, take advantage of their free accounts or trials, and spend a little time with them. That’s the only real way you’ll be able to get a feel for them yourself and decide which one’s best for you. 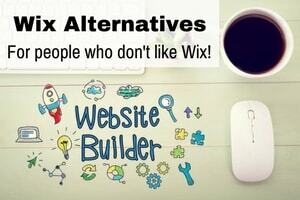 I’d love to hear about what it is about Wix that lead you here in the first place seeking an alternative. Is it the website editor, didn’t you like the templates, have you had a bad experience with customer support or did you find it too expensive? I’d love to hear your experience with Wix so fire away in the comments section below.